Long-awaited sophomore release features mesmerizing vocals and lush instrumentation. Produced by über producer Dave Tucciarone, it will instantly transport the listener to Hawai'i. Guests include: Bryan Tolentino, Jeff Peterson & Kawika Alfiche. It’s rare when an artist arrives on the scene offering a refreshing new spin on a traditional genre of music. Steven Espaniola is that artist. Raised in Aliamanu, Hawai’i and now residing in the California Bay Area, Steven is a multi-instrumentalist specializing in Ki Ho'alu (Hawaiian Slack Key Guitar), ‘Ukulele and Leo Ki'e Ki'e (Traditional Hawaiian falsetto). 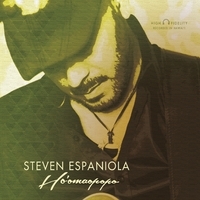 Of Hawaiian, Filipino and Spanish decent, his ethnicity is as diverse as his unique sound which preserves the integrity of the traditional with a flourish of the modern. Ho'omaopopo (to understand), instantly transports the listener to Hawai'i with lush instrumentation and soaring falsetto vocals. The album features guest artists Bryan Tolentino, Jeff Peterson, Casey Olsen, Matt Sproat and Kumu Kawika Alfiche. Produced by über producer Dave Tucciarone, it is sure to become a classic and a favorite in every Hawaiian music collection! This is Steven's second and as good or better than the first. If you want to know the guy a bit go to UTUBE and check out "in the car with Andy", and his name.